HPA is a real estate operating company with 30 years’ experience in managing all types of properties including healthcare and special needs. We provide consultancy in range of services areas as outlined below. We serve as consultants for healthcare systems and other property owners in a variety of areas including master planning, portfolio analysis, acquisition analysis, operational expense reduction, tax appeal services and geographic benchmark monitoring. We are effective in controlling growth and making efficient use of existing space, and can provide leadership of real estate services across whole enterprises. Our dedicated acquisitions team can provide expertise in all aspects of real estate, including entitlement, architecture, engineering, energy efficiency, real estate law, tax law, compliance and more. 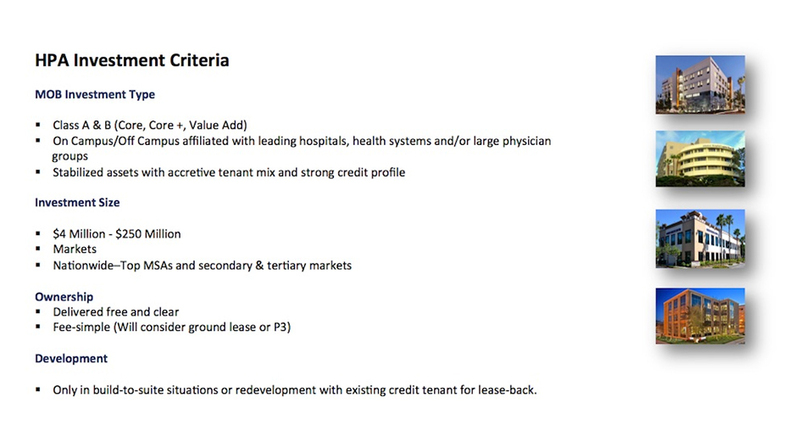 Our asset x criteria focus is on strategic locations with its proximity from on-campus or adjacent to major healthcare systems. We have completed over $6 billion in medical construction and have the capabilities to fund, construct, own and operate medical and healthcare office buildings. Our unique ownership structure provides us with sources of capital through The Innovation Institute model, and project opportunities in five regions and 29 states across the country. We provide services in landlord and tenant representation, commercial and medical real estate brokerage, valuation and compliance related documentation. This is often under exclusive agreement as owner and tenant representative. Our incredible personnel further our values-based approach. We administer customer satisfaction surveys and improvement plans, provide structured in-house training programs, and have superior talent recruitment capabilities. We provide financial analysis and “fair market” surveys to ensure we comply with regulatory audit processes. We undertake engineering audits to recommend building equipment efficiency enhancements. Our fully integrated accounting software programs deliver real-time data. We provide complete leasing services. We engage on-site engineering staff to operate our managed facilities. As part of an encompassing service, HPA provides an analysis of each property’s taxes and special assessment values. Upon its individual audit, we work with the owners for any necessary appeals and reassessments. We provide due diligence and fact gathering, lease renewals and abstracting, and various administration services.